In the Next Generation episode "Second Chances," we're introduced to Will Riker's clone, who was created via transporter accident eight years earlier during a routine plot device calibration. Going by Riker's middle name, "Thomas," by the end of the episode, the still-just-a-lieutenant version of Riker left the Enterprise and was pretty much forgotten, other than a DS9 plotline wherein he stole the Defiant and ended up in a Cardassian labor camp. CBS Television Distribution It really was too much raw sexuality for television audiences of the time. 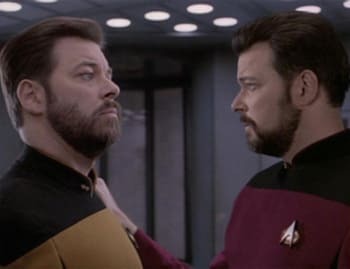 Despite making history as one of the most screwed-over Trek characters ever, Thomas Riker was nearly given the upper hand by producers, who wanted to kill off Will and replace him with Thomas. 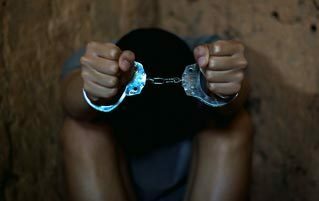 The plan was to "reboot" the character, putting him in the Ops position and having him work his way back up the ranks. This would provide a far more realistic excuse for Riker continuing to be on the show instead of constantly deferring a promotion to captain. 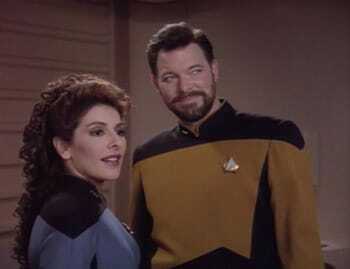 Also, as Thomas was still very much in love with Deanna Troi, this would introduce a new potential romantic subplot to the show and provide an element of tension about whether he might, uh, breach her warp core. CBS Television Distribution Or alternatively, dock in her Shuttlebay 1. Ultimately, the writers decided that killing OG Riker would be going a little too boldly where no one had gone before, so they beamed Thomas off to the planet of unresolved plotlines. They also felt it would be more interesting to have both versions of Riker floating around the galaxy, leaving the door open for awkward get-togethers in the future. A door which they utterly forgot about forever. When a show is in pre-production, its creators will tinker with characters' backstories and looks until they find what they hope is a winning recipe. For example, at some point during the planning stages of TNG, Wesley Crusher was a girl, Geordi had a Jamaican accent, and Troi was a non-humanoid alien. And while having Leslie Crusher instead of Wesley Crusher may be the stuff of Trekkie fantasies, what nearly happened to Jean Luc Picard is the stuff of their nightmares. Apparently, the production team had a hell of a time deciding if Picard should sound English or French, so Stewart performed some scenes (including the opening narration) with a French accent, just to take it for a test drive. Which means we came terrifyingly close to exploring "Space, ze final fronteeah." In addition to working out what Picard would sound like, Stewart's hair -- or lack thereof -- was another sticking point. 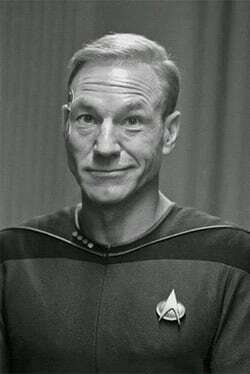 Gene Roddenberry was adamant that a bald English dude couldn't possibly be "the new Captain Kirk," and was initially opposed to Stewart trying out for the part of Picard at all. Even though Roddenberry warmed to Stewart, he wasn't budging on the hair issue, and even had a wig flown from London to Los Angeles for Stewart to wear during a tryout. CBS Television Distribution Make the Federation Great Again. As you may have noticed, Picard did end up bald, which means Roddenberry eventually caved and realized that members of the Federation would probably be more concerned with Romulans than Rogaine. Roddenberry even stated that Picard was bald because "hair doesn't mean anything in the 25th century." Which sounds hilariously naive to modern ears, now that we know how important beards are to first officers. While Star Trek: The Motion Picture gave us our first taste of the series on the big screen, the movie probably isn't anyone's favorite Trek film. For most, it's what we suffer through in order to get to "KHAAAAAAN!" At best, it made us think a bit about the consequences of firing junk into space. But hey it could have been ... OK, not exactly better, but definitely way more odd. While what we got was a missing satellite and a bald robot in a short skirt, what we almost got was Captain Kirk fighting Alien Jesus. We'll give you a moment to develop that mental picture. How many hammer punches and clumsy forward rolls did you envision? Eight? Nice. As it happens, an early version of the film pitted the crew against a shapeshifting alien that would assume the forms of various biblical figures. 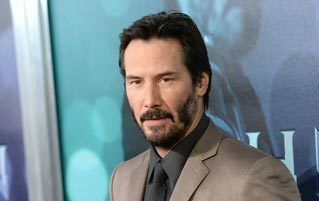 "In the climactic scene, Kirk had a fistfight with an alien who had assumed the image of Jesus Christ," Star Trek author and screenwriter Michael Jan Friedman said. "So Kirk was slugging it out on the bridge. With Jesus." Now before you get all hot and bothered thinking how cool it would be to have Kirk drop-kicking Jesus aboard the Enterprise, it's our duty to remind you of Star Trek V: The Final Frontier, in which Kirk fights God. The one time the Star Trek universe dabbled in religion, we get a steaming piece of crap so fragrant that even its producer admits it "almost doomed the franchise." Paramount Pictures God, you do good work, but you do not belong in Star Trek. While there wasn't talk of killing him off (that we know of), Geordi La Forge narrowly avoided some serious character reprogramming of his own. You see, in one almost-happened storyline, Geordi was revealed to be the technologically inclined, visually challenged spawn of an alien who impregnated his mother. Yes, really. CBS Television Distribution The black guy was quite literally almost only three-fifths human? Seriously? According to writer and producer Jeri Taylor, Geordi's mom had an "almost Rosemary's Baby-kind of thing," giving birth to the half-human offspring of an unknown alien, which might have explained La Forge's similarly awful track record with women. The truth of Geordi's parentage would have come to light when his people showed up looking for him. Fortunately the idea got scrapped, possibly because Deanna Troi had already done the whole alien impregnation thing, and possibly because they were saving it for Harry Kim, who experienced almost this exact nightmare in an episode of Voyager. CBS Television Distribution "I noticed you picked a not-white guy again ..."
When the 30th anniversary of the franchise rolled around, writers for Deep Space Nine wanted to mark the occasion with some sort of special episode. Suggestions were offered, ideas were kicked around, and while we ended up with odd-looking Klingons and lots of Tribbles, we very nearly got a throwback that was way, way more meta. CBS Television Distribution Also they found a way to reuse all those rejected Picard hairpieces. You see, someone had the bright idea of going back to the planet Iotia from the TOS episode "A Piece Of The Action," in which the crew encounters an entire society that's based itself on a history book about mobsters in Chicago. When the crew of DS9 visited the planet, they'd find the entire place changed after the encounter with Kirk and Spock, with the culture and religion now based on the Enterprise crew instead of 1920s mob bosses. CBS Television Distribution "An entire planet that worships me? Sounds plausible." According to writer Ronald D. Moore, the planet's Kirk-obsessed population would "have conventions" and "know all the adventures." His vision was "to send the [DS9] characters to a Star Trek convention" as "a kind of comment on fandom, and people's involvement with the show from afar." In short, there'd be an entire planet of Trekkies. Producers eventually put an "all stop" on the plan, since it'd be almost impossible to do without making fun of their viewership and talking down to them. The concept didn't completely die, though, and the core idea was revisited years later in the Voyager episode "Virtuoso," in which the Doctor becomes a celebrity on a Delta Quadrant planet. CBS Television Distribution Voyager: where ideas that couldn't cut it on TNG and DS9 finally got their day in the sun. As a huge Star Trek fan, actor and comedian Eddie Murphy was understandably jazzed at the prospect of starring alongside Kirk and Spock in one of the Trek films. And in early versions of the script for Star Trek IV: The Voyage Home, Murphy was slated for a "sidekick" role in the portions of the film that take place in modern-day San Francisco. There, Murphy would run around acting like Eddie Murphy, while Shatner and Nimoy made faces and tried to keep up. In case you're a little foggy on the premise, Star Trek IV is "the one with the whales." When an alien probe threatens to destroy 23rd-century Earth if it can't talk to some whales -- which are extinct -- Kirk and the Enterprise crew travel back in time to 1986 to retrieve some. Paramount Pictures This is one of the better Trek movies, believe it or not. So why wasn't Murphy in the final version of the film, hanging out with Kirk and Spock and having a whale of a time? Turns out he was super interested in going to space, but considerably less psyched about, uh, "coming to America." As Murphy put it, "I wanna be in space! I wanna beam up! I don't wanna be in San Francisco." While Murphy later got his space on in the timeless classic Pluto Nash, the sidekick role was reworked for Catherine Hicks, who joined the cast as a whale biologist and love interest for Captain Kirk. The Original Pitch For The Series Was A "Wagon Train To The Stars"
Although every episode begins with a not-so-subtle reminder that the crew of the Enterprise is here to "explore strange new worlds," "seek out new life and new civilizations," and "boldly go where no one has gone before," the original concept for Star Trek was a lot more along the lines of "Wagons ho!" When Gene Roddenberry first pitched the series in 1964, he envisioned a "wagon train" concept, featuring "characters who travel to worlds 'similar' to our own, and meet the action-adventure-drama which becomes our stories." One ship, the S.S. Yorktown, would do most of the ferrying, and her "skipper," Captain Robert April, would head up the cast of characters for the "space western." CBS passed on Roddenberry's pitch, citing its similarity to Lost In Space. And while we're confident Fox would have eventually picked it up, called it Firefly, and cancelled it to the dismay of viewers everywhere, Roddenberry decided to revise his premise. The result of his editing was the TOS original pilot, called "The Cage," which interested NBC enough for them to order a second, revised pilot, and eventually the entire series. And so history was made. Roddenberry got his show, Shatner didn't have to get that dusty, and we never had to sit through any tedious episodes about Klingons rustlin' space cattle. CBS Television Distribution Shatner would have almost certainly still bagged several green alien farm daughters a season, though. Do you like Star Trek? Do you like horses? If you answered anything above "meh" to either question, then you'll love William's Shatner's book "Spirit Of The Horse: A Celebration In Fact And Fable." Also check out 9 Incredibly Dumb Early Versions Of Iconic Characters and 8 Iconic Characters That Were Originally Insane. Subscribe to our YouTube channel, and check out 5 Terrible First Drafts of Iconic Characters , and watch other videos you won't see on the site!